Having a little piece of the world to call your own has always been a cornerstone of the American dream. Couple it with a picket fence and a dog, and you’ve got a perfect Norman Rockwell vision of Americana. It all begins with home ownership. Things are finally starting to look up. Jobs are being added to the economy and the long financial night may finally be over for many Americans. There has never been a better time to own a house! Here are four reasons why now is the time to buy. 1.) The rent is too dang high! For many Americans, the decision not to buy a house is motivated by their current housing affordability. They’re happy where they are and there’s no incentive to move. What could go wrong? 2.) The price will keep going up! The traditional advice about home ownership is that it’s the best investment you can make. Over time, the value of your home will increase. The rate of increase is never fantastic, but it’ll gradually go up. That represents an increase in your total net worth. For most people, a house is the biggest piece of their net worth. The converse is equally true. The longer you wait to get into the housing market, the more expensive it’ll be. That’s never been more true. The median house price now is $178,400. By May 2017, experts agree the price will have increased to nearly $196,000, which is past the peak pre-recession price. Confidence in the housing market is clearly on the rise. Roughly 5.2 million people plan to buy homes this year. That will keep housing prices on the rise looking forward. 3.) Rates are low … but not for long! 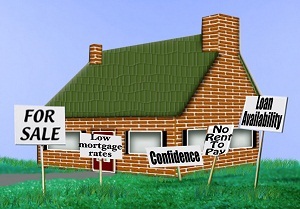 Low interest rates are the biggest boon to potential buyers. If it’s cheaper to borrow, a mortgage will ultimately cost less in the long run. Mortgage rates are currently stalling around 4% for a 30-year mortgage. Experts expect those rates to rise to 5% by the end of the year. That may not seem like much, but a 1% increase in mortgage rate increases the cost of a 30-year loan by about 11%. The low interest rates were an effort by the central bank to aid economic recovery. Now that recovery is well underway, it’s only a matter of time before rates are raised again. Buying now can mean tremendous savings. Now’s the time not to delay! A year ago, mortgages were hard to come by. Lenders were under very close scrutiny and no one without a superior credit history was in line for a loan. The shadow of financial crisis was still looming large. Now, lenders are taking advantage of low rates and a booming market to make loans more available. Lower down payments and more complicated credit histories are getting approval for homes. That’s a dream come true for millions of families. As this is partly a response to market conditions, these rates won’t last forever. It might not be long before loans tighten up again. If you’re on the fence about home ownership, you owe it to yourself to speak to a mortgage representative. Otherwise, you might wake up to find the fence has been sold – to another buyer.